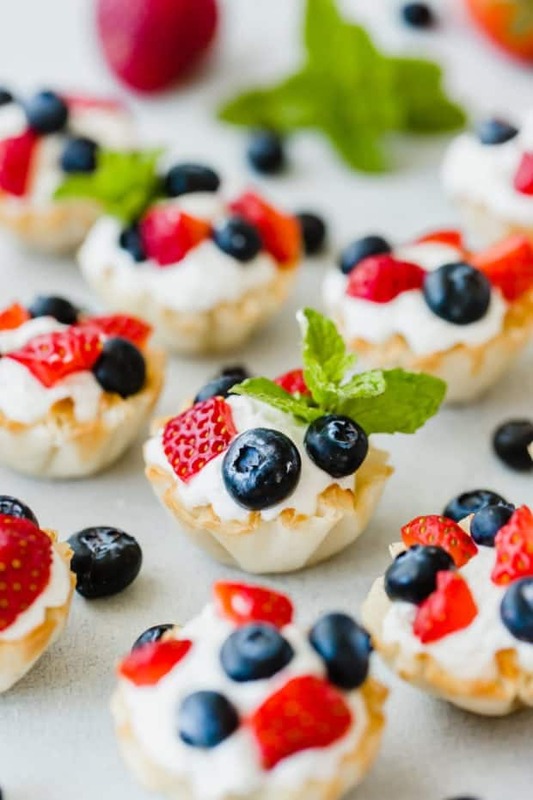 Whether you’re throwing a 4th of July party, having a barbecue, or you just want to enjoy a delicious finger food, these Greek Yogurt Fruit Bites are just what you need! 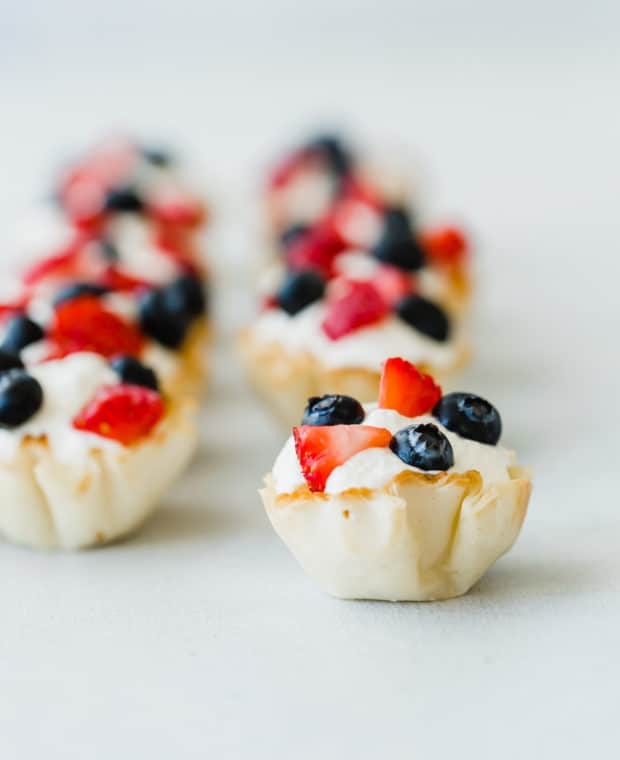 Flaky fillo shells are filled with a sweetened greek yogurt whipped cream and topped with fresh fruit. This delicious treat serves as the perfect appetizer or dessert! I love finger foods! Honestly, who doesn’t!? 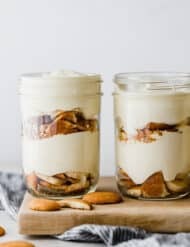 Whether it be a delicious and creamy chip dip, caramel apple dip, or jalapeño poppers! Finger foods for parties are ALWAYS a good idea. Truthfully, you can never have too many finger food recipes in your recipe box. With that being said, I want to introduce you to a new series I’m starting at Salt & Baker. Drumroll please…. I’m going to post a lot of finger food recipes over the next 6 months. Right now I plan on posting a new finger food recipe every other Friday. It’s going to be so much fun! 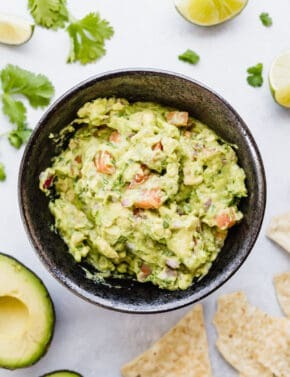 Tell your friends, neighbors and family members that Salt & Baker will be featuring delicious party food, finger food recipes, easy appetizer ideas, dips and more! I’ll continue to post more than just finger food recipes, but FINGER FOOD FRIDAY will be a series featured specifically on Salt & Baker. 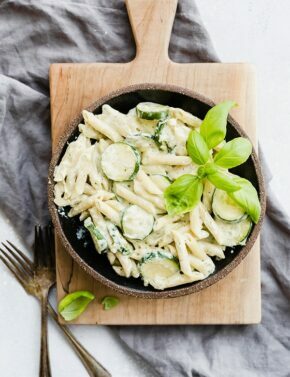 Now that you’ve been introduced to the new series, lets dive into this delicious recipe. I’m a bit obsessed with my Greek Yogurt Whipped Cream recipe. Have you made it? It’s superb. 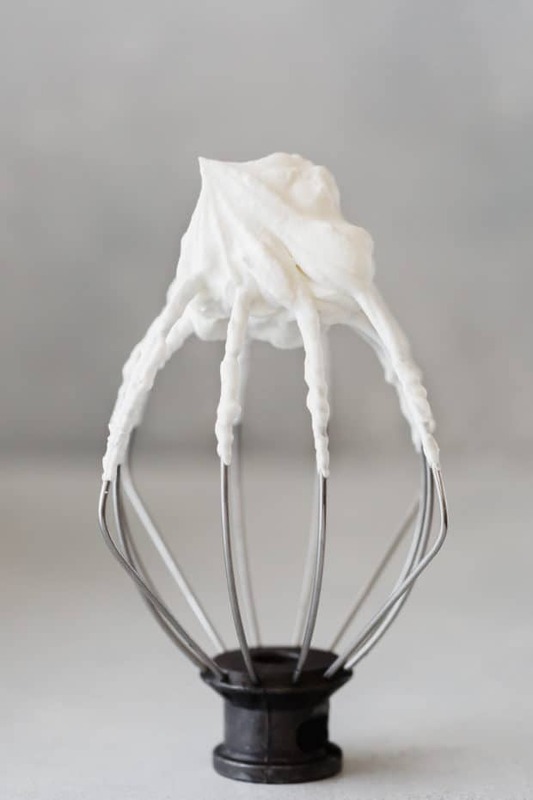 I’m offering some tips and tricks to help you obtain the perfect whipped cream. Let’s do this! 15-20 minutes prior to whipping the cream, place your metal mixing bowl and wire whisk in the freezer. Chilling the bowl and whisk ensures the cream stays COLD during the mixing process. For optimal whipped cream, you want the cream nice and cold. Whipping cream is best served immediately. Same goes for greek yogurt whipped cream. 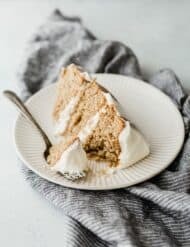 Because the process of whipping cream only takes a total of 5 minutes, I’ll usually make the freshly whipped cream right before I need it (minus adding the greek yogurt to it). However, if you’re unable to do this and you’re short on time you can whip the heavy cream in advance. 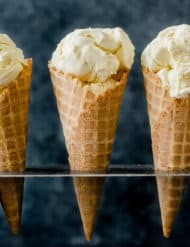 Simply whip the cream until soft/medium peaks form and refrigerate it for up to 2 hours. When ready to serve, re-whip the cream until medium/stiff peaks form, add the greek yogurt and mix until combined. 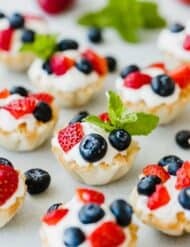 Pipe the cream into the fillo shells and top with berries. Once you have the Greek Yogurt Whipped Cream made, it’s time to prep the fruit. I chose to garnish with chopped strawberries and blueberries. I thought the red and blue combination would work perfectly for the 4th of July. ?? 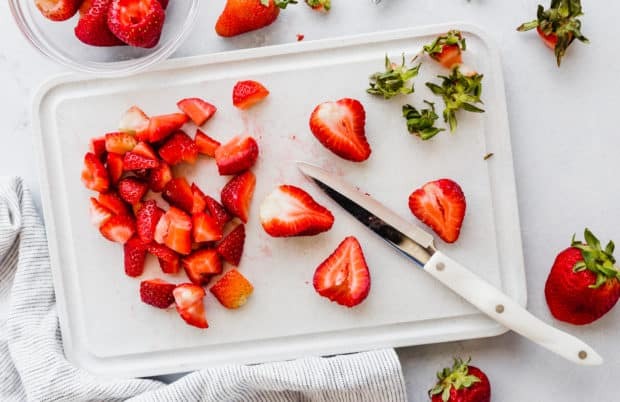 However, you can use whatever fruit you have on hand. Some other great ideas include chopped kiwis, mangos, bananas, raspberries, blackberries, pomegranates, and peaches. This is a versatile finger food recipe so have fun with it! 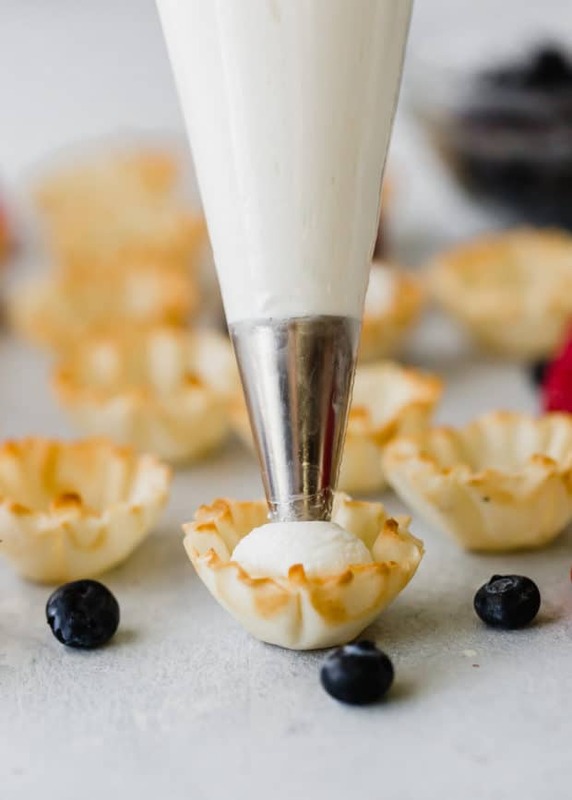 In order to make assembling easier, I placed the greek yogurt whipped cream in a piping bag and filled the fillo shells in a matter of minutes! It was a breeze! Use a piping bag, you’ll be glad you did! 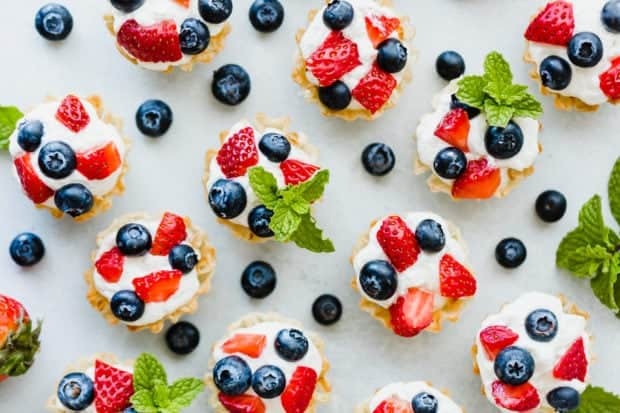 The final touches include scattering the chopped fruit overtop the whipped cream, maybe garnish a few of them with some mint leaves and voila! You have the perfect finger food for a party! This recipe requires little time, is STUNNING, and tastes amazing! 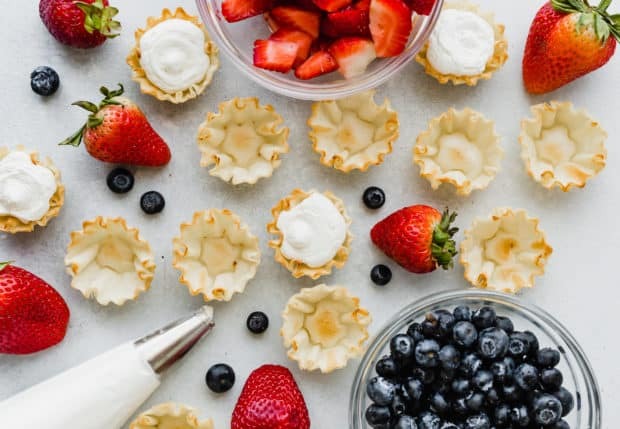 What’s not to love about a crisp and flaky fillo shell filled with a creamy greek yogurt topping and cold fresh fruit! It’s a match made in heaven. 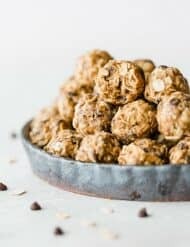 If you’re looking for additional healthy finger foods be sure and check out my no-bake energy bites. 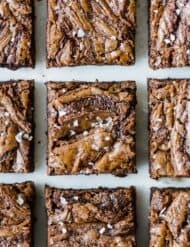 They’re EASY to make and so tasty! Craving more? SUBSCRIBE TO SALT & BAKER to get new recipes and newsletters delivered straight to your inbox! 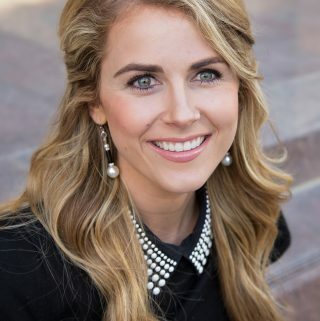 And stay in touch on Facebook, Twitter, Pinterest and Instagram for all of the latest updates. The perfect summer finger food! 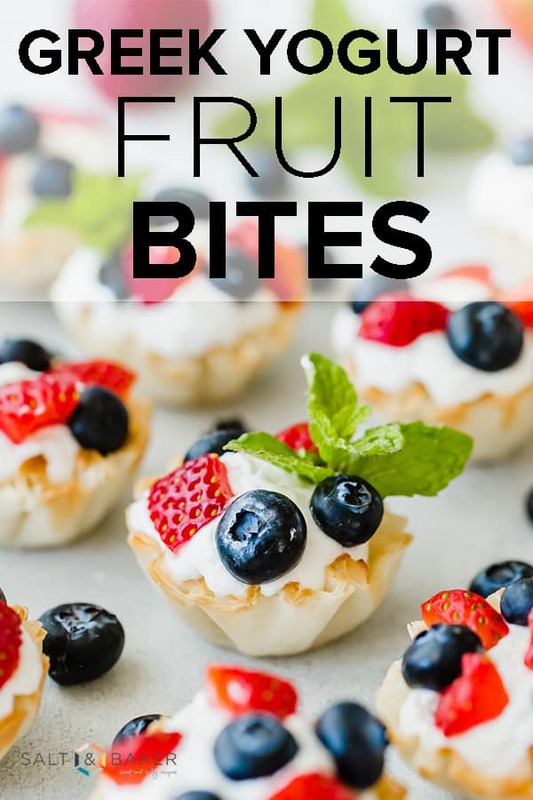 These Greek Yogurt Fruit Bites are perfect to serve to a crowd! They are the perfect 4th of July finger foods. or any other fruit you'd like! In the bowl of a stand mixer fitted with the whisk attachment, beat the heavy cream, vanilla, and powdered sugar on medium-low for 1 minute. Slowly increase the speed to medium-high and mix until stiff peaks form. Add the greek yogurt and mix for 20 seconds on medium or until thoroughly combined. Place the cream mixture into a piping bag * and pipe the cream into the individual mini pillow shells. 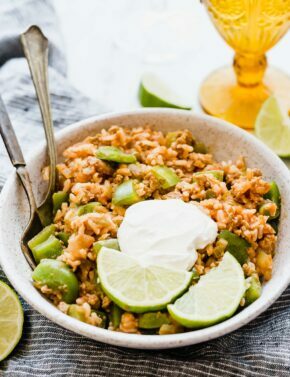 Top with chopped fresh fruit. Serve immediately or keep in the fridge in an airtight container until ready to serve. Best served within a few hours. *Not necessary. You can just spoon the cream into the shells if you'd like. The piping bag just made it easier for me. Note, the nutrition facts do not include the fruit. 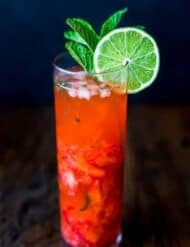 This recipe partially inspired by A Zesty Bite. YUM! These look absolutely gorgeous and so colorful! Perfect for summer brunch! These were really refreshing! Loved the Greek yogurt whipped cream. Will be making these again.